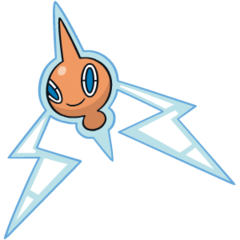 Rotom does not evolve/is not evolved into. 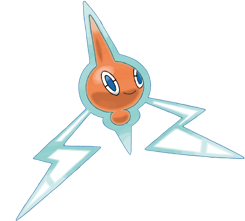 X Dieses Pokémon wurde lange Zeit erforscht, um als Energiequelle für einen besonderen Motor zu dienen. X Un Pokémon longtemps étudié comme source d’énergie pour un moteur très spécial. X Desde hace mucho tiempo se estudia su singular motor como fuente de energía motriz. X Questo Pokémon è stato usato a lungo per ricerche come forza motrice su motori speciali. X 특수한 모터를 움직이는 동력원으로서 긴 시간 동안 연구되었던 포켓몬이다. Y Sein Körper besteht aus Plasma. Mit ihm kann es in elektrische Geräte eindringen und für Chaos sorgen. Y Son corps est fait de plasma. Il cause de gros dégâts en infiltrant des appareils électroniques. Y Su cuerpo está hecho de plasma. Puede infiltrarse en dispositivos electrónicos e inutilizarlos. Y Il suo corpo è composto di plasma. È solito infiltrarsi negli strumenti elettronici per provocare caos. Y 플라스마로 된 몸을 가지고 있다. 전자 제품에 숨어들어 나쁜 짓을 하는 것으로 알려졌다. Omega Ruby Its body is composed of plasma. It is known to infiltrate electronic devices and wreak havoc. Omega Ruby Sein Körper besteht aus Plasma. Mit ihm kann es in elektrische Geräte eindringen und für Chaos sorgen. Omega Ruby Son corps est fait de plasma. Il cause de gros dégâts en infiltrant des appareils électroniques. Omega Ruby Su cuerpo está hecho de plasma. Puede infiltrarse en dispositivos electrónicos e inutilizarlos. Omega Ruby Il suo corpo è composto di plasma. È solito infiltrarsi negli strumenti elettronici per provocare caos. Omega Ruby 플라스마로 된 몸을 가지고 있다. 전자 제품에 숨어들어 나쁜 짓을 하는 것으로 알려졌다. Alpha Sapphire Research continues on this Pokémon, which could be the power source of a unique motor. Alpha Sapphire Dieses Pokémon wurde lange Zeit erforscht, um als Energiequelle für einen besonderen Motor zu dienen. Alpha Sapphire Un Pokémon longtemps étudié comme source d’énergie pour un moteur très spécial. Alpha Sapphire Desde hace mucho tiempo se estudia su singular motor como fuente de energía motriz. Alpha Sapphire Questo Pokémon è stato usato a lungo per ricerche come forza motrice su motori speciali. Alpha Sapphire 특수한 모터를 움직이는 동력원으로서 긴 시간 동안 연구되었던 포켓몬이다. Diamond It has a body made of plasma. It is known to slip inside electrical appliances and make mischief. Pearl It has a body made of plasma. It is known to slip inside electrical appliances and make mischief. Platinum Its electric-like body can enter some kinds of machines and take control in order to make mischief. HeartGold Research continues on this Pokémon, which could be the power source of a unique motor. SoulSilver Research continues on this Pokémon, which could be the power source of a unique motor. White Its electric-like body can enter some kinds of machines and take control in order to make mischief. White 2 Its electric-like body can enter some kinds of machines and take control in order to make mischief.